How to get PRODUCT ID of the product for Shopify? Whats new is Shopables 1.1 ? There are two ways to get Product ID of the product. Login to your admin panel. You will see a list of products you have on your store. Click on product you wish to get Product ID of. Paste in the browser, but add “.json” at the end of it. This highlighted code will be your Product ID. Copy it. For enable Shopify Checkout, you have to connect your Shopify store with Shopables account. Then in place of product URL you have to use these Product IDs. This will give you opportunity to give instant shopping experience directly from image. Posted on January 25, 2019 Categories HOW TOTags ecommerce, images, marketing sales, shopify, shoppables, shoppingLeave a comment on How to get PRODUCT ID of the product for Shopify? This is how you connect your Shopify store with Shopables. How to get Storefront API key? From your Shopify admin, select Apps. Click Create a new private app. Scroll down a bit. In the Storefront API section, select Allow this app to access your storefront data using the Storefront API. Where to find Store URL? Login to your Shopify Admin Panel. Take a look at left panel. Click on Online Store under Sales Channel tab. You will see a sub menu in it click on “Domains”. Copy your primary domain name which ends with myshopify.com. That’s it. Now you have got both Storefront API key and Store URL. Let’s connect it with your Shopables account. Go to My Account page. 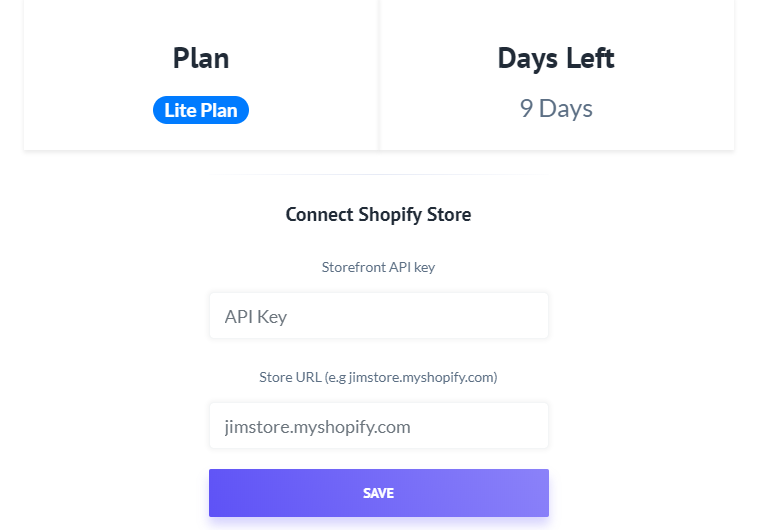 You will “Connect Shopify Store” option. Paste both Storefront API key and Store URL. Click on SAVE. Done! You have successfully connected your shopify store with Shopables. You are ready to give visitors an option to checkout directly from image for the first time.